The delegation that went to the city-hero, were party to the Kursk Battle Isaac Lanzmann, deputy chairman of the city council of veterans Sergei Kondratenko and chairman of the Vladivostok branch of the public organization "Combat Brotherhood" Victor Donets. This is not the first visit of representatives of the city on the site of significant battles. At the initiative of the MayorIgor Pushkarev in 2010 a delegation went to Moscow to Vladivostok and Moscow, in 2011 - in Brest, 2012 - in Sevastopol. And Kursk. - With the excitement food on the Kursk land: hard to remember those terrible fights, but the joy that I see Kursk, smoking and perhaps his fellow soldiers - said on the eve of departure participant Battle of Kursk Isaac Lanzmann. On the front, he volunteered in September 1941. In July 1943 the radio operator fox (such he had call letters) was only 20 years old. For two daysbefore his birthday Man wounded: a fragment of mine hit in the leg - this is his war was over. After 70 years, he was back on the Kursk Bulge. - To say that we have met with dignity, then say nothing - says Isaak. - Met with honors. And so much attention has been given to us the more that people Kursk were very surprised that we even arrived - after 10-odd hours of the summer. Vladivostok for smokers - the edge of the earth. A guide to the city of Kurskexpressed special thanks to the administration of Vladivostok for the fact that they sent a delegation to them of the feast. Our delegates participated in the laying of flowers and wreaths at the memorial in honor of the heroes ¬ smokers. Were at a ceremony at the governor of Kursk region, laid wreaths at the memorial "Kursk", the tomb of the Unknown Soldier, a monument to Zhukov. I especially remember our delegates parade and frontline dinner, which was attended by Prime Minister Dmitry Medvedev. Eyes onveteran - In addition to the formal dinner frontline congratulatory speeches I sang "Morse code" - continues to Isaac Lanzmann. - Song of the war that has cost many lives, and the soldiers left alive. Now veterans receive congratulations and gratitude not only for myself, "but for that guy." The meeting was a very memorable and exciting The war left a mark for life, can not forget about her loss and victory, because it was sacred. In Kursk, remember the time of the occupation, and how welcome was the release of the invaders. Experienced terrible, but not forgotten. It crashed into the genetic memory of generations. And already gray-haired soldiers of that war is always genuinely happy. - Unfamiliar people, children and adults alike, came and congratulated, gave flowers - emotionally recalls Isaak. - Caught up with us riot police platoon commander ordered: Eyes on veteran! The soldiers greeted us, saluting. 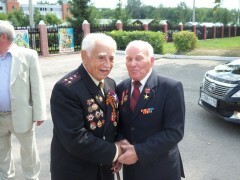 Outside of the official celebrations Kursk seemed to say: "We remember your sacrifice and glad to see you." City memorials city itself produced a great impression of our delegates. - Kursk just very green, lots of trees, especially the weeping willows - continues Isaak. - A kind of terrain, architecture. The city is very well maintained, it is 980 years old, and residents of about 400 thousand Kursk we loved. But to compare him to Vladivostok inappropriate - we have the sea, terrain, new roads, highways, interchanges, bridges and more rapid way of life. Pleased with our fellow countrymen and scale of the holiday: the ensembles were, there was a parade of garrisons Kursk, Belgorod and Orel, a procession of bands. The sacred land of veterans came from the Ukraine, Belarus, Poland, many cities in Russia - only 61 delegation. On the frontline dinner, by the way, was an interesting case: a veteran of the Eagle learn that Isaac Lanzmann from Vladivostok, gave him a booklet about their city, on which he wrote "Do not return to the land of the Far East!". As it turned out, after the war, served as a fighter in the Kuril Islands, and the topic for him is still relevant. Liked veterans and monuments, many of which in Kursk. Especially memorable State Military ¬ Historical Museum "Prokhorov field." It includes the Victory Monument "Belfry" Church of the Holy Apostles Peter and Paul, on the walls of which are marked the names of 7382 soldiers killed in these bloody battles. There, in Prokhorovka, build a house of veterans, cultural and historical center. There is a lot of work with children and young people. Hold regular conferences related to the history of our country, meeting with veterans of the Great Patriotic War and the Battle of Kursk Prokhorovka tank battle. Constantly on display documentaries and films on the military ¬ patriotic themes. - It's all done so big, that's amazing - explains the chairman of the organization of war veterans "contingent" Sergey Kondratenko. - There are monuments to the heroes of the Great Patriotic War, the heroes of local wars, our submariners - a bunch of generations in few places I've seen. Memorial to the Battle of Kursk great. Are the sprawling blue spruce, you come back - trembling breaks, I want to stretch out at attention. We, too, can be the Victory Park, for example, near the Youth House, where there are already memorials, there Avenue of Heroes. And at Cape Nazimov where it is planned to establish a museum of military glory of the city, you need to do is not just a memorial, and the center of patriotic education of youth and the urban zone of attraction. Still we liked the musical fountain, where they play only songs of the war years. His city has presented the owner of a large retail chain. This is what we told the head of Vladivostok Igor Pushkarev Sergeyevich. He is always very responsive to our suggestions, tips, many implements. With great interest listened to the head of impressions and reflections returning from the long journey and inspired by "travelers". Delegates expressed confidence that Beijing is obliged to mark the 70th anniversary ¬ Victory in the Great Patriotic War, no less grand, inviting delegations to cities, which at one time took our veterans. To Berlin! From Vladivostok to the museum Kursk were given capsules with water from the Pacific Ocean and Earth with Voroshilov battery and an icon of Our Lady of Port Arthur - the defender of Vladivostok. According to the chairman of the city council of veterans James G. Kahn - inspirer and organizer of the Veterans of our trips to cities, where fighting vladivostoktsy, it is expected that the delegation of the city will go to Konigsberg and Berlin. Mrs. Matveeva, the newspaper "Vladivostok"